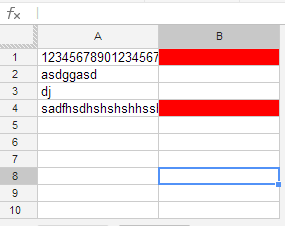 In Google Spreadsheets, is there a way to conditionally format a cell if it has more than 30 characters? Yes! Highlight the cells you want to format. Go to Format > Conditional Formatting. Then just assign a background color/text color. If you have selected an entire row, you will need to adjust the range if you've got a couple of heading cells. In my case, I selected the entire column but I only wanted to check starting at A4 and continuing to the last row in the column. In this example, the range then should be A4:A. This will check column A, whether the entry has more than 30 characters and will return TRUE or FALSE. =len(A1)>30 withRange: `A1` and the formatting of your choice. Set the colour as you wish. Simply pull the cell down to let this rule apply to other cells in column A!